Part of a nativity scene from the Church of the Company of Jesus in the city of Oaxaca. Joseph and Mary are dressed in Oaxacan costume. Christmas in Mexico is celebrated during a season that begins in early December to January 6, with one other related event on February 2. During this entire time, one can see nativity scenes, poinsettias and Christmas trees. The season begins with celebrations related to the Virgin of Guadalupe, the patroness of Mexico, followed by traditions such as Las Posadas and pastorelas. There is a mass and feast on Christmas Eve, the arrival of the Three Wise Men on January 6 ending with Candlemas and the presentation of Child Jesus images at churches. These traditions are a mixture of remnants from the pre-Hispanic period, Spanish traditions, traditions created during Mexico’s colonial period and later adaptations from German and United States Christmas traditions. The Christmas season in Mexico runs from December 9 to January 6, with one last related celebration on February 2. These various traditions incorporate remnants of indigenous practice, customs from Spain, novel Mexican inventions from the colonial period and later Germanic and U.S. elements. Market activity begins to grow in late November, with traditional markets swelling and new tianguis (street) markets appearing with stalls dedicated to selling gifts and decorations which include traditional poinsettias and nativity scenes as well as items such as Christmas trees, ornaments, electric light and even reindeer figures. Starting in December, many homes, businesses and other buildings are decorated with poinsettias, which are called "noche buena" (from the Spanish phrase that means "good night" referring to Christmas Eve) . Mexico is the origin of the pointsettia. In the pre-Hispanic period, they were called cuetlaxochitl, and a favorite in the mid winter when they were a symbol of the new life that they believed that fallen warriors received, returning as hummingbirds and butterflies to drink the nectar. A modern Mexican legend says that the pointsettia was once a weed that miraculously turned into a beautiful flower so that a child could present it to the infant Jesus. The name for this plant is also used to refer to a dark bock-style beer which is only available during the Christmas season. Christmas tree and lights in the main plaza of the city of Chihuahua. Since the later 20th century, Mexico has adopted a number of German and U.S. Christmas traditions. Christmas trees were originally imported into Mexico for the expatriate community, but have since become more popular with the Mexican population, either placed with more traditional nativity scenes or in some other location. Christmas trees have become more common as personal incomes rise and tree prices fall, with artificial trees easily available in places like Wal-Mart, Costco and Mexican chain stores. Live trees are also common and Christmas tree production in Mexico is now a large industry. For poorer families that cannot afford live trees, alternatives are small artificial trees, or even branches from local trees or shrubs. In 2009, Mexico hosted the world’s largest Christmas tree according to Guinness at 110.35 meters (approximately 362 feet) high and weighing 330 tons on Glorieta de la Palma on Paseo de la Reforma . Santa Claus, still in his traditional red winter clothing, appears as well. Before Christmas Day it is not uncommon to see stands with Santa for children to have their picture taken. After Christmas Day, these stands have one or more Wise Men. Many children now get presents from both Santa Claus and the Wise Men, although they tend to get more from the Wise Men "because there are three of them". Many public Christmas season celebrations mix Mexican and foreign traditions. Mexico City sponsors a Christmas season set up on the city’s main square or Zocalo, complete with a towering Christmas tree and an ice rink which has become a tradition. Nativity scenes are placed here and along Paseo de la Reforma. During the season it is common to hear Christmas music, both traditional and contemporary. Traditional music includes villancicos (akin to Christmas carols) with popular songs being "Los pastores a Belén", "Riu, riu, chiu: El lobo rabioso" and "Los peces en el río". Contemporary music includes Spanish covers of foreign music, such as Jingle Bells. Niño Dios (Child Jesus) dressed in Tzotzil costume. The most traditional and important Christmas decoration is the nativity scene. Generally set up by December 12 and left on display at least until February 2 and found in homes, businesses and churches. They were introduced in the early colonial period with the first Mexican monks teaching the indigenous people to carve the figures. The basic set up is similar to those in other parts of the world, with a focus on the Holy Family, surrounded by angels, shepherds, Wise Men and animals, which are sheltered by a portal, which can take the shape of a cave, stone house or cabin. Above the scene is a star, often with an electric light. Since the colonial period, a number of purely Mexican twists have been added, starting with the use of Spanish moss covering the base. The scene is missing the figure of the Child Jesus until Christmas Eve. Although all other images are generally proportional to the rest of the scene, the image of Jesus is much larger, almost that of a life sized baby. This image is not only central to the nativity scene but is also important to a tradition of bringing the image to church on February 2 to be blessed. Traditional figures are made from ceramic or plaster. One of the more traditional areas that produces ceramic figures for nativity scenes is the Guadalajara area, especially the towns of Tonalá and Tlaquepaque. From late November into December, the Tonalá market has dozens of stalls that sell nothing but supplies for nativity scenes. In addition to the more usual figures, Mexican nativity scenes have a number of unique ones. These include native Mexican plants and animals such as nopal cactus and turkeys, women making tortillas, fish in a river (referent to a popular Mexican carol), a crowing rooster (reference to Christmas Eve) and even images of Lucifer to hide in the shadows (a reference to the pastorelas). Nativity scenes can be found in all sizes and complexities. The large-scale nativity scenes can be quite elaborate, with multiple landscapes and even entire villages. These usually start with a base of sturdy brown paper, crumpled to simulate a landscape sometimes with the support of multi-tiered bases. Over this base, moss, sawdust, sand, colored paper, paint and more are used to recreate deserts, grassland, rivers and lakes. Over these are a wide variety of structures and figures which can include houses, churches, wells, vendors with carts of fruits and vegetables, playing children, musicians, dancers, cooking food, and more, all surrounding the center in which is the Holy Family. The nativity scene of the main church in Chapala has featured imagery from all over the world including wooden shoes, an igloo, figures to represent Africans and exotic animals. The noche buena (poinsettia) is native to Mexico and is widely used as a decoration during Christmas time. Pastorelas, which roughly means “shepherds’ plays,” are theatrical works done by both amateur and professional groups during the Christmas season. They were originally developed in the early colonial period as a didactic tool to teach the Christmas story. The traditional pastorela begins with an angel telling the shepherds of the birth of Christ. The shepherds then follow the star of Bethlehem but are plagued on the way by attempts by the Devil to keep them from arriving. However, good triumphs in the end and the shepherds arrive. The script of the plays is often improvised by the actors and varies immensely and can include elements such as jokes, jeers, slang, songs, bawdy humor, discussions, cigarettes, tequila and even ladies of the evening, mostly focusing on the interaction with and struggle against Satan and his tricks. The most traditional of these plays are found in rural areas. Variations exist from a focus on Mary and Joseph’s travel to Bethlehem, battles between the Archangel Michael and the Devil and registering with authorities to even ones with feminist themes. The Christmas season begins with celebrations in honor of the Virgin of Guadalupe, Mexico’s patron saint. On December 3, a nine-day novena is begun in honor of the Virgin of Guadalupe, which ends on her feast day of December 12. The most important event related to this time is the pilgrimage to her basilica in the north of Mexico City, with people coming to pay respects by all means of transportation from airplanes to bicycles to walking. This pilgrimage is undertaken by a large number of Mexican Catholics, regardless of race or class. For example, every year hundreds of members of the Japanese Mexican community (which is mainly Catholic) make the pilgrimage in kimonos. The area in and around the basilica begins to crowd with lights, fireworks and indigenous people dancing starting at dusk on December 11 and goes on all night and into the next day. This image of the Virgin Mary is honored in all of Mexico in various ways. In the city of Oaxaca, the main event is at Parque Llano on December 11, with small boys dressed as Juan Diego at the church to be blessed. In the very early morning hours of the 12th, the song Las Mañanitas is sung to the Virgin Mary. Breaking a piñata at a Posada. From December 16 to 24 there are a series of procession and parties called Las Posadas (from the word for inn), for many children the most anticipated part of the Christmas season. The tradition was begun by Spanish evangelists to teach the Christmas story to the indigenous people and ostensibly to substitute the rituals related to the birth of the god Huitzilopochtli. Today they are most often performed in rural areas and in the lower-class neighborhoods of cities. The first part consists of a procession. The most traditional version heads out after dark each of the nine evenings from a local church. A girl and boy are chosen to play Mary and Joseph in costume, sometimes with Mary riding a donkey. The rest of the procession carries candles, paper lanterns and/or decorated staves and often an empty manger. If no one is dressed as Mary and Joseph, the procession generally carries a nativity scene. Las Posadas generally serves as a way to maintain community bonds with neighborhood. In one variation, the procession arrives at a house and divides in two. One half remains outside and sings a traditional song to ask for shelter. The other sings the response from inside, and the ritual ends with everyone inside. The other variation has the procession go to three houses singing, two of which "reject" the party until the third house accepts. The piñata started as a medium by which the Evangelists used to teach Christian beliefs to the natives. With the traditional star-shaped piñata still being broken by children during the Posadas. Like the procession, the Mexican piñata has symbolic and didactic meaning. The vessel represents Satan who has all the goods of the world, decorated to attract people. There are most traditionally seven points to represent the seven cardinal sins. The stick represents the Christian faith to defeat evil and release the treasure for all. After piñatas there is meal which usually includes tamales, atole, buñuelos and a hot drink called ponche, which is made from seasonal fruits such as tejocote, guava, plum, mandarin orange, orange and/or prune, sweetened with piloncillo, a kind of brown sugar, and spiced with cinnamon or vanilla. For adults rum or tequila may be added. Ponche recipes vary greatly in Mexico. The Colima version usually includes milk, sugar, orange leaves, vanilla and grated coconut. At the end of a posada, guests received a small gift called an aguinaldo, usually a package with cookies, dried and fresh fruit and candy. Then carols called villancicos are sung. A very old tradition has the song sung to the nativity scene to the newborn Child Jesus. The last posada is early Christmas Eve. What follows is a late night Mass called the Mass of the Rooster. It originated about six years after the arrival of the Spanish, when Father Pedro de Gante began a celebration of Christmas with a late night Mass. The name comes from the tradition that the birth of Christ was announced by the crowing of a rooster. The celebration became popular among the newly converted indigenous as it included elements from the old celebrations for the god Huitzilopochtli such as fireworks, torches, sparklers and plays along with food and dancing. Following the Mass, there is a traditional midnight feast. Traditional dishes include bacalao, reconstituted dried cod cooked with onions, tomato sauce, olives and more. Another is revoltijo de romerita, which is green in a mole or pepita sauce, with potatoes and often dried shrimp. The most luxurious item on the menu used to be suckling pig but this has mostly been replaced by turkey or ham. After dinner adults drink ponche or cider and children play with sparklers, called luces de Belen (Bethlehem lights). Christmas presents are usually opened at the strike of midnight. The rest of Christmas Day is quiet in Mexico as families recuperate from the festivities the night before, often eating leftovers from the midnight dinner. December 28 is Mexico’s version of April Fools' Day called Los Santos Innocentes (The Sainted Innocents) originally to commemorate those boys killed by King Herod with the aim of avoiding the arrival of Christ. It is also said that on this day one must can borrow any item and not have to return it. In the 19th century, elaborate ruses would be concocted to get the gullible to lend things on this day. If successful, the victorious prankster would send a note to the lender and a gift of sweets or small toys in memory of the children killed by Herod with the note saying "Innocent little dove who allowed yourself to be deceived, knowing that on this day, nothing should be lent.” This then developed into a day of pranks in general. This even includes newspapers printing false wild stories on that day. This is also celebrated online as well in recent years. New Year’s Eve falls during this time as well. It is celebrated much like most of the rest of the world with some exceptions. One notable tradition is the eating of twelve grapes rapidly along with the twelve chimes of the clock at midnight (a tradition shared with other Latin countries), to bring luck for each of the months of the coming year. Fireworks are common and in very rural areas the festivities may include shots fired in the air as well. In some parts of Veracruz, December 31 is reserved to honor elderly men with the Fiesta del Hombre Viejo. Girl with balloon and note to send to the Three Wise Men on the night before Three Kings' Day. The next major event in the Christmas season is Epiphany called Día de los Tres Reyes Magos (Three Kings’ Day). This day celebrates when the Three Wise Men arrived to visit the Child Jesus bearing gifts. On the night of January 5, children traditionally leave a shoe by the doorway where the Wise Men will enter, although this is not done in all parts of Mexico. Another variation of this is sending the note in a helium balloon into the sky. Inside is a thoughtful note explaining why they have been good or bad that year and the gifts they would like if deemed worthy. 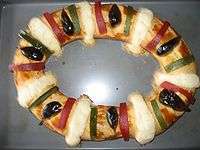 In the morning after opening the presents, a round sweet bread called a rosca is served, it is baked with dried fruit and tiny images of the infant Jesus inside. Whoever gets one of these figures in his/her slice must pay for tamales for Candlemas on February 2. The rosca is served with tamales and atole. Candlemass is celebrated on February 2, as it commemorates the presentation of the Child Jesus to the temple. On this day, people bring their images of the Child Jesus to be blessed. These are elaborately dressed, traditionally in christening gowns but many other costumes have since appeared as well. Afterwards, tamales and atole are shared, purchased by the people who found the miniature Jesus images on January 6. There are various regional Christmas season traditions. In Alvarado and Tlacotalpan, there is the Fiesta Negrohispana, which is a celebration of African identity in Mexico which runs from December 16 to the 24th. In Oaxaca, a major event during this time is the feast day of the patroness of the state, the Virgin of Solitude on December 18. She is honored with precessions called calendas, with allegorical floats and costumes. The traditional food for this is called buñuelos, a fried pastry covered in sugar. In coastal areas, her image is often brought to shore by boat, accompanied by other boats with brass bands. In the city of Oaxaca on December 23, there is an unusual event called La Noche de los Rabanos (Night of the Radishes). Oversized radishes are carved into elaborate figures. Originally these were for nativity scenes but today there is a major competition in which the vegetables are carved in all kinds of figures. In the Xochimilco borough of Mexico City, January 6 is important as the day that the best known Child Jesus image, the Niñopa, changes “hosts” or the family that will take care of the over 400-year-old image for the year. In the Nativitas section of the borough, there is a parade of the Wise Men, sometimes with real camels. Wikimedia Commons has media related to Christmas in Mexico. 1 2 3 4 5 6 7 8 9 10 11 12 13 14 15 16 17 18 19 20 21 22 23 24 25 26 Kastelein, v (2001). "A Mexican Christmas". Business Mexico, suppl. Special Edition 2001. 10/11 (12/1): 82–85. 1 2 3 4 5 6 7 Preston, Julia (November 8, 1997). "Mexico City: Day of the Three Kings". New York Times Magazine. 6 (part 2) (8): 2. ↑ Cevallos, Diego (December 6, 2003). "Mexico: One million return home for Christmas from U.S.". Global Information Network. New York. p. 1. 1 2 3 4 5 6 7 8 9 10 11 12 13 14 15 16 17 18 19 King, Judy (December 1, 1999). "Christmas holidays in Mexico: Festivals of light, love and peace". Mexconnect newsletter. ISSN 1028-9089. Retrieved November 30, 2012. 1 2 Flagg, Ann (1999). "Los Posadas, Christmas in Mexico". Instructor (1999). 110 (4): 38. 1 2 3 4 5 6 7 8 9 10 11 Hoyt Palfrey, Dale (December 1, 1997). "Feliz navidad: Making merry in Mexico". Mexconnect newsletter. ISSN 1028-9089. Retrieved November 30, 2012. ↑ Meacham, Bradley (November 30, 2000). "Christmas Tree Farms Turn to Mexico As Demand Slips in U.S.". Knight Ridder Tribune Business News. Washington, D.C. p. 1. 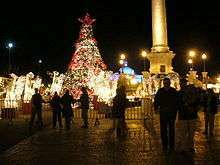 ↑ "Mexico City erects world's largest Christmas tree: MEXICO-CHRISTMASTREE". EFE News Service. Madrid. December 6, 2009. ↑ "Mexico City Celebrates Christmas on Ice: December Brings Festive Sights and Activities to the Distrito Federal". PR Newswire. New York. December 19, 2011. 1 2 3 4 5 Dumois, Luis (December 1, 1998). "Mexico's Christmas posadas, pastorelas and nacimientos". Mexconnect newsletter. ISSN 1028-9089. Retrieved November 30, 2012. 1 2 "Christmas in Mexico". Weekend All Things Considered. Washington, D.C.: National Public Radio. December 21, 1996. p. 1. ↑ "Colonia japonesa en México visita Guadalupe en 54º peregrinación anual". Aciprensa. Retrieved 19 December 2014.